In his April 6, 1917, proclamation declaring war on Germany, President Woodrow Wilson laid out regulations pertaining to non-naturalized men (over age 14) of German origin in the United States. These regulations were later expanded to include Austro-Hungarians and women. They were summarized in publications such as the one from the Connecticut State Council of Defense included in this activity. German citizens living in the United States were required to register at their local post office, carry registration cards, and inform authorities if they intended to change residences or employers. During the course of the war, around 2,300 German-born civilians were interned as “dangerous enemy aliens” at Fort Oglethorpe, Georgia, and Fort Douglas, Utah. It was not only non-naturalized Germans who faced suspicion and mistreatment, however, as evidenced by the case of Carl Herrmann and the anti-German riot in Middletown, Connecticut, in the summer of 1918. Has America always been a “Land of Opportunity” for immigrants? What makes someplace a “Land of Opportunity”? In what ways did World War I affect attitudes towards foreign-born immigrants in Connecticut? To what extent were the public messages about treatment of immigrants—both “official” and unofficial—consistent? In what ways were the rights of Connecticut residents restricted during World War I? Why has immigration been such a controversial issue throughout American history? 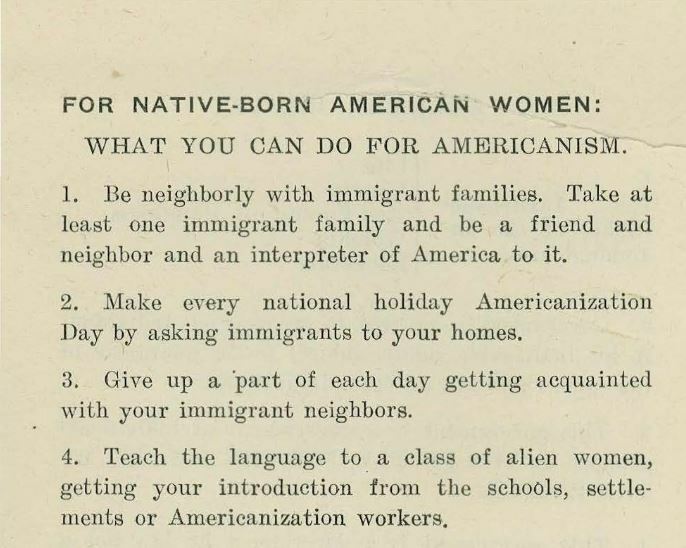 “For Native-born American Women: What you can do for Americanism,” detail from the pamphlet American Ideals, produced by the Connecticut State Council of Defense, ca. 1917-18. Connecticut State Library Digital Collections. 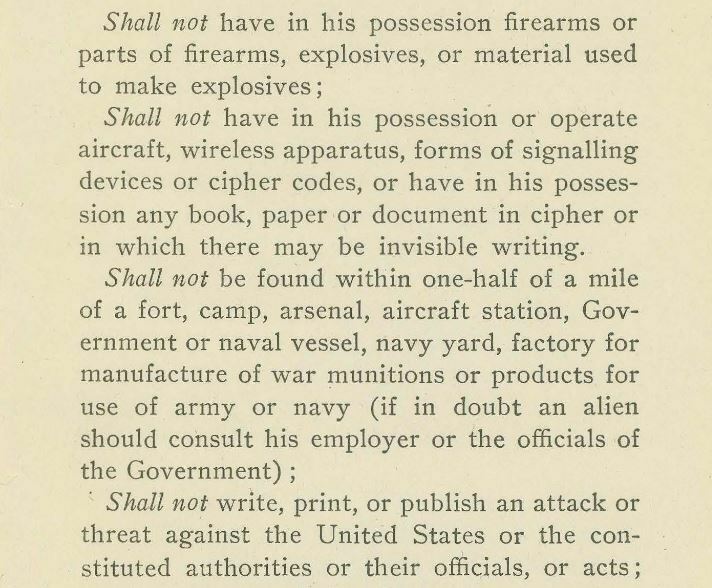 “Suggestions and Requirements for Enemy Aliens Contained in the President’s Proclamation of War, April, 1917,” produced by the Connecticut State Council of Defense, ca. 1918. Connecticut State Library Digital Collections. “Germans Forced to Kiss Flag by Mob.” Middletown Evening Press. August 3, 1918. 8:1-2. Courtesy Connecticut State Library. “Millane is Freed; Three Others Held.” Middletown Evening Press. August 5, 1918. 8:1-2. Courtesy Connecticut State Library. “Local Rioters are Scored by Court.” Middletown Evening Press. August 6, 1918. 8:2. Courtesy Connecticut State Library. “Public to Pay Rioters’ Fines.” Middletown Evening Press. August 7, 1918. 8:1. Courtesy Connecticut State Library. “Law or Mob Law?” Middletown Evening Press. August 8, 1918. 8:2. Courtesy Connecticut State Library. “Casper Schmidt is Loyal to America.” Middletown Evening Press. August 7, 1918. 8:2. Courtesy Connecticut State Library. As a class, discuss the compelling and supporting questions that will guide the inquiry. “For Native-born American Women: What you can do for Americanism.” Connecticut State Council of Defense. 1917-18. “Suggestions and Requirements for Enemy Aliens Contained in the President’s Proclamation of War, April, 1917.” Connecticut State Council of Defense. For each of the two sources, ask students to apply the SOAPStone analysis technique, being sure to identify the author/issuing body; intended audience; occasion/reason for the document; and main points being communicated. What does each document say explicitly OR imply about the “official” position towards immigrants at the time? Revisit the supporting questions and add new student-generated questions that arise from the examination to the list. For Part 2 of the inquiry, students will examine (individually or in small groups) a series of articles published in the Middletown Evening Press about an incident that occurred in August 1918. Keeping the supporting questions in mind, students should make notes about the facts recorded in the newspaper, opinions/attitudes (stated or implied), and questions that they have about—or inspired by—what they have read. Students will share what they found most interesting about the incident and the newspaper coverage, as well as their new questions. As a class, revisit the supporting and compelling questions and discuss additional avenues for inquiry, if students wish to learn more. Imagining themselves as Middletown residents in the summer of 1918, students will write two letters to the editor of the Middletown Evening Press. The first will explain why she or he intends to contribute to the public collection taken up to pay the rioters’ fines. The second will explain why she or he intends not to contribute. Students will use contemporary newspapers and additional sources to investigate immigration issues today and will create a graphic organizer illustrating similarities and differences between issues today and those during WWI. These may include the cultural/racial/religious background of the immigrants in question, the language/words used in the public discourse, proposed actions or “solutions,” etc. Interested to know more about what went on in your town during World War I? Visit your local library and ask if they have newspapers from the time on microfilm or in bound volumes. “Winning the Great War without Some Books” by Mark Jones, © Connecticut State Library. All rights reserved. “War and the Fear of Enemy Aliens” by Karen Frederick and Anne Young. Greenwich Historical Society. Stibbe, Matthew. “Enemy Aliens and Internment.” International Encyclopedia of the First World War, ed. by Ute Daniel, Peter Gatrell, Oliver Janz, Heather Jones, Jennifer Keene, Alan Kramer, and Bill Nasson, issued by Freie Universität Berlin, Berlin, 2014. Phelps, Nicole M. “Austro-Hungarian Enemy Aliens (USA).” International Encyclopedia of the First World War, ed. by Ute Daniel, Peter Gatrell, Oliver Janz, Heather Jones, Jennifer Keene, Alan Kramer, and Bill Nasson, issued by Freie Universität Berlin, Berlin, 2014. Gross, Daniel A. “The U.S. Confiscated Half a Billion Dollars in Private Property During WWI.” Smithsonian.com, July 28, 2014.